Finding the heart of any sport depends on how bad you want to see it. You could take the pulse on endless ball games and still come up short, or scan every Olympic track and field event and still be looking. If the heart of sport is struggle, what defines it better than wrestling where the internal clash between quitting and continuing gets laid bare every time two athletes step on a mat? Here the DNA of strong tendons and quick twitch muscle should make the difference between victory and defeat. But it’s those who refuse to quit who win, and winners who do what it takes to win again. My heart of wrestling is Dave Abraham, the Bulldog wrestling coach in North Bend, Oregon. He seemed old when I met him, at least thirty two. I was fifteen. His wrestling room had state champions and Junior World team members. He’d already been a Junior World Greco coach. One of his guys had been outstanding wrestler at the Junior Nationals in Iowa City. This is the room where Dave Abraham coached himself into the National Wrestling Hall of Fame in Oklahoma. This is the room I grew up in. In his early coaching days Dave Abraham asked one of his guys to go the cultural exchange meet. It was on a Saturday and the Bulldog wrestler wanted to sleep in. Abraham made a deal. He said if he came out and wrestled him on his front yard and won, then he had to go to the tournament. The coach won and the wrestler won a trip to Japan. Who knew wrestling could take you overseas? Seasons passed, triple crowns won by the good guys, scholarships to Oklahoma by the best, and it was over. I finished with a district championship, a first in Greco, a sixth in freestyle, and a third at Iowa City nationals. 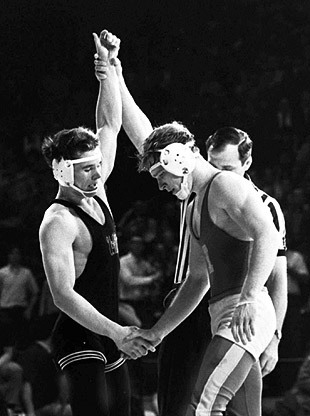 Got to work on takedowns with Dan Gable in 1973 after the ’72 Olympics where no one took him down. Got to wrestle for a junior national championship in Iowa with an Oregon All Star team. Abraham was back there but didn’t travel with the team. I wrestled a varsity year at Southern Oregon College and went to an all-Army wrestling camp in Fort Dix, New Jersey. It felt like a lot for a nineteen year old. I competed against some of the best of my generation and came away humbled by the experience. My younger brother Steve came into Dave Abraham’s wrestling room four years after me. He was good enough to wrestle for a district title and smart enough to pay attention. Steve was a baseball player who could hit good pitching from Babe Ruth League through four years of college ball. The heart of wrestling pulled him into the room and made him a coach. I have the sons in the family. When they were youngsters I took them to the Oregon State Wrestling Championships and introduced them to the heart of wrestling. Dave Abraham asked if they wrestled. They didn’t. I worked in a museum and coached the boys’ soccer teams. Not the traditional route to gold medals, yet the spirit of wrestling found a way. They both wrestled in high school. I had a mat in my garage and a heavy bag for boxing, or throwing practice. The youngest got to fifth place at cadet state Greco, the oldest won a Greco and freestyle championship. They both know the heart of wrestling. One night I got a call from a high school teammate. He said Dave Abraham was in the hospital. It didn’t sound good. It was eight at night, dark. I got in the car and drove to the heart of wrestling. His family sat in the softly lit waiting room, his own daughters grown into lovely young women. No one could see Dave Abraham. They wanted to keep a positive feeling. I convinced them I was a positive influence, reminding the girls how I helped their dad in the garage. I got five minutes alone with the heart of wrestling. I’d learned how to talk to people who seemed unconscious by the work I did with my father in law. They really do listen. “No one did what you did. Organizing trips and taking teams cross country. Getting more from your guys than they knew they had. Dave Abraham didn’t look good. I put my hand on his arm, a near wrist. A conversation I had with my father in law on his death bed inspired him to live five more years after his doctor gave him two days. I would do the same here. I would find Abraham’s match clock and reset it. “You took guys that would ordinarily not leave North Bend and turned them into world travelers. Japan, New Zealand, South Africa, Des Moines Iowa. He hadn’t moved, hadn’t peeled my hand off. Sometimes it takes longer. “Coach Abraham, you got us all started. You made me a champion. My brother is in the hall of fame because of you. My boys are champs because of you. I owe you more than I can ever repay, but I’m going to ask you something. I need you to do something. Coach, can you hear me? Dave? Abe? Monitors clicked and pumps hissed and the heart of wrestling loped along. A few weeks later hundreds, if not thousands, of his sons showed up to pay their respect. Dave Abraham’s gift was handing the heart of wrestling to others, and the men gathered in his memory all had a piece of it. They belong to a brotherhood that knows the difference between quitting and continuing, and are brave enough to carry the fight. That is the heart of wrestling. You’re one of a long line of Bulldogs to leave the North Bend mats, but they never leave us, and neither does Mr. Abraham. I’m glad to hear good things about Coach Swanson. Thanks for finding deegeesbb, bulldog160. You’re always welcome here. I hope to share the common concern we all ought to have with the people we care about. Thank you for noticing. Be sure and look at the book ‘Wrestle With Care’ at the top. If you’d like to stay current with DG’s B&B, put an email address in the right hand sidebar and new posts will get delivered hot off the keyboard. you know This is very true. basically explains everything. The truth is, I am a Bulldog. I’ve been a few other things since, but being a Bulldog has been a guide. Ernest Hemingway, who looked like a bulldog, said to try and write one true sentence. So I try. Thank you for noticing. Wrestling Room might not explain everything to everyone, but it should. I enjoyed this skimpy piece of writing.